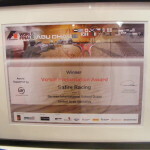 Safire Racing’s 2012-team took part in the F1 in Schools World Finals 2012 in Abu Dhabi, and placed 14 our of 33 teams. Additionally, we won the prize for the Best Verbal Presentation! The World Finals 2012 were an unbelievable experience for all of us. Below are our prizes visualized, the daily summaries of the competition days, written in phases of fun, stress, and emotions, aswell as the image gallery. What a feeling waking up at 5 AM to get ready to set off to Ferarri World and set up our pit displays. It was really a pain getting the pit display to Ferarri World on Sunday, but we made it and taking it up to the set up area wasn’t a big problem aswell. The pit display was set up in two hours, and we’re seriously proud of it. We uploaded a picture on Facebook if you want to check it out. After the great opening ceremony, we directly started as one of the first teams at the time trial racing together with Team Shift from the US. Our fastest time was 1.117 seconds, which is alright – We would have expected more, but we are definitely confident with the result. After a short break, we went to our verbal presentation, which is basically a 10 minute summary of the whole project. The presentation worked great! Additionally, the pit display judging directly after that was also great. Judges seemed impressed. We didn’t have the big stress on setting up anything today, so we enjoyed sleeping a little longer than yesterday. Today, we had the engineering judging and the scrutineering interview on the plan. Laurenz and Till sat down with the jury for an hour, watched them check the car on all rules and guidelines, and then answered all questions they have. Additionally, we had the reaction time racing, which was quite alright. The knockout competition was postponed to tomorrow due to some delays in the timetable. That was all that happened today. Tomorrow will be a long day, and we will have the prize giving. There should be a live stream available – We will update you on that then. After a quick rehearsal of the prize giving that would happen later in the evening, we finally had the knockout race, which was cancelled yesterday, due to delays in the timetable. We ran against the girls from The Red Cheetahs from Austria and sadly were knocked out in the first round already. But that still didn’t get us down – It was a very well done effort of the girls! Nothing much happened after that, except the team going completely crazy by riding the fastest roller coaster of the world … Later in the evening, the prize giving took place, and we won the prize for the best Verbal Presentation. 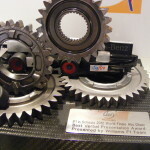 After intense minutes, the world finals 2012 were finally announced: they’re Cold Fusion from Australia. Congratulations to them, they’re a great team and deserve it. What a day, once again! It all ended with an awesome after party and a massive round of Gangnam Style.